Does your accent or the sound of your voice make you seem more trustworthy? Dr Laurence White, Senior Lecturer in Speech and Language Sciences at Newcastle University presented his fascinating research on this topic at January’s SciBar. In nature, some signals are considered ‘honest’ and can be trusted. For example, a peacock with an elaborate tail signals his fitness to potential mates and rivals. Growing a large tail not only requires a lot of energy but additionally, it is a burden that makes him an easy target for predators and yet he has survived. This tail ─ as a fitness measure ─ is honest. Similarly trustworthy, though for different reasons, are the alarm calls of meerkats. Meerkats exist in close family groups and genetically, their interests lie in preserving this group. Therefore, any alarm call to signal danger to the group, despite attracting unwanted attention, is usually an honest one. When we think about human communication where dishonest signalling and lies are rife, things become much more complex. Laurence’s work looks at the sounds of speech and whether accents and tone of voice influence how trustworthy we are perceived. Accents could be seen as a broadly honest signal. While not impossible, it is difficult to pass yourself off convincingly as having a different accent, so how we speak to some extent reflects our geographical and social upbringing. Interestingly, some informal surveys have shown that people are perceived to be more or less trustworthy depending on their accent. For example, in one such survey, received pronunciation, RP (roughly “Queen’s English”) and rural accents like Devon came out on top, with big city accents such as the Liverpudlian (“Scouse”) accent being less trusted. Interestingly, however, the Geordie accent is perceived as trustworthy and friendly, which could account for the many call centres based in and around the city. While some accents may be considered more trustworthy than others in surveys, is this likely to affect people’s behaviours towards each other in real life, even when we have clear independent evidence of trustworthiness? After all, our accent is largely an accident of birth and upbringing and should provide little or no information about our true character. To investigate, volunteer participants were asked to play a game with an undisclosed (computer simulated) partner. On each of 20 rounds, the participant was given and asked to invest between £0 and £8. With each round the partner received three times the investment and returned some fraction of that to the participant, which could be more or less than their initial investment. Unbeknownst to the participant, the partners were programmed to be mean (equating to a bad overall return on the volunteer’s investment), or generous (a good investment return), although the exact level of return varied from round to round. The amount the participant invests is taken as a measure of their trust in their partner. Indeed, it only takes a few rounds for the participants’ investment to dramatically change according their partners’ overall mean or generous behaviour. The key point in this experiment was, however, whether the accent of the partner affects the level of investment, which ought to be determined purely by the monetary evidence of their meanness or generosity. Before each investment round, participants heard a prompt from their computer partner: this was simply a neutral encouragement to continue investing, such as “The goal of the game is to earn as much money as possible.” Crucially, the accent in which these prompts were spoken varied between games. In line with the informal surveys, partners with RP and Devon accents got higher initial investments than Birmingham and Cockney for the first few rounds, regardless of whether the partners were ‘mean’ or generous’. Amazingly, the partners with the RP accent continued to attract a small but significantly greater amount of investment throughout the experiment, with investment in other accents also varying. Similar experiments have since been carried out that further demonstrate the accent effect: even when we have strong (monetary) evidence about someone’s level of trustworthiness, their accent – a largely arbitrary feature – still affects our perception. A potential reason for this finding is the link between accents and the location in which they originate. In general, city dwellers are considered less trustworthy than those from the country. As the RP accent has no associated geography, this may limit such biases, with accent familiarity and social status potentially also playing a role. Later in the talk, the discussion expanded to further research about how other aspects of your voice, such as pitch, speed and rhythm also impact how you are subconsciously judged. In versions of the above experiment, higher pitched voices tended to be considered more trustworthy. However, the effect did not last throughout the whole experiment, as pitch ─ as a signal ─ may not be considered ‘honest’ (it’s easy to fake). Slowing speech also helps to build trust, being thought to indicate more consideration in speakers, that is, willingness to take the extra time to clearly express their words to listeners. Despite the audience now being acutely aware of their own accents, questions were plentiful, and a significant point was raised as to whether the accent of the participants impacted the results of the experiments. Although this was not controlled for in the study, Laurence did point out that generally people are more trusting of familiar accents. There was also discussion about whether musicians emphasise their accents to make their music more authentic, trustworthy and friendly. Something that fans of the Arctic Monkeys, The Streets or Maximo Park will no doubt be familiar! For our final SciBar of the year, Advanced Biomedical Scientist Audrey Perry, from the Freeman Hospital in Newcastle, shared with us some fascinating insights into cystic fibrosis (CF) and its current therapies. This genetic condition brings about a build-up of sticky mucus in the lungs and pancreas and difficulty in breathing which, along with frequent lung infections, can be very challenging for a CF patient. With over 10,000 people affected in the UK, is there hope for a more effective management of this condition? It has been found that mutations in the Cystic Fibrosis Transmembrane Conductance Regulator (CFTR) gene can wreak havoc on the normal transport of epithelial fluid in our lungs, pancreas and other organs. There are six classes of mutations affecting the CFTR gene and it is important to recognise which one a patient has in order to select the most suitable therapy. CF manifests in many different ways across the whole body including heart disease, hypertension, bronchitis and pneumonia. Unlike in normal lungs, mucus in the CF lung is very thick, persistent and difficult to remove. Detecting the faulty gene early is therefore critical, so treatments can be started as soon as possible. Since 2007, all new-borns in the UK have been screened, using a genetic ‘heel prick’ test. Treatments for CF include inhaled drugs that help to clear the airways, antibiotics for lung infections, physiotherapy and nutritional feeding among others. Kalydeco (Ivacaftor) is the first precision medicine for CF that is available in the NHS. It is a ‘personalised’ medicine, specifically targeted to CF patients with a gating mutation such as G551D and allows for the normal balance of salt and water in the cells in the lungs. Orkambi (Ivacaftor/Lumacaftor) is another precision combination therapy that is used to help get more proteins in the surface of cells and to maintain the normal flow of salt and water in the lungs – although at the moment it is not available in the NHS. With ongoing research into other drugs and therapies, who knows what new drugs will be introduced in the near future. Watch this space! For those who are unable to get any benefits from these drugs, a double lung transplant is another option. It is not to be taken lightly, however, as specific criteria (such as very poor lung function and high burden of care) must be met by those considering undergoing this procedure. Tests must also be performed to ensure you do not have Burkholderia cenocepacia or Mycobacterium abscessus complex in your lungs. Having these bugs in your lungs before the transplant may contribute to the failure of the transplant and death due to infection. These bugs can remain in the throat or chest cavity and infect the new transplanted lung, which is a huge problem when the patient’s immune system is already compromised by the transplant. Freeman Hospital survival rates are 84% at 1 year post transplant, 70% at 3 years, 60% at 5 years and 53% at 10 years, which is relatively high, but obviously worth improvement! Is it just the advances in lab testing and therapies that contribute to the safe management of this condition? Of course not! We have specialist CF teams to thank for their hard work, in addition to the expert microbiologists who tailor specific treatments to the patient, to the biomedical scientists who test patient samples, nurses, social workers and other healthcare professionals that deliver care at the bedside. It truly is a team effort and just as important is the commitment and compliance of the patient to their therapy. CF is a life-limiting inherited disease and there is currently no cure, however, with advances in testing and personalised medicine, there are high hopes for a better life expectancy and ultimately a world without CF. On the 21st of November SciBar welcomed Ríona McArdle from the Brain and Movement Research group at Newcastle University, who asked us this very question. We have all seen videos of people walking into things while texting, which, in addition to providing comedic relief, shows that walking becomes more difficult when our brain is distracted. This is because walking is a complex task. Although we rarely notice it, walking requires lots of brain power to coordinate movement with visual information about where we are heading. As we get older our brains shrink and so our walking tends to slow down. For patients with dementia, both brain shrinkage and slow walking becomes even more pronounced. There are two major types of dementia: Alzheimer’s disease and Lewy body disease. While most people have heard of Alzheimer’s, the less recognised Lewy body disease has a slightly different set of symptoms, including hallucinations and movement problems. Ríona, a passionate neuropsychologist, explained how this link ─ between physical movement and dementia ─ has the potential to make dementia diagnosis cheaper, quicker and easier. One goal of her work is to assess whether you can tell the difference between people with and without dementia, by looking at the way they walk. Additionally, as differentiating between these two dementia subtypes can be tricky, Ríona hopes that this method might prove to be a useful addition in the diagnostic toolkit. This second goal is critical, as treating patients who have Lewy body disease with Alzheimer’s medication may actually make them worse. So how did she test walking in relation to dementia? Ríona’s study recruited patients with both Lewy body disease and Alzheimer’s, along with healthy controls of the same age and then she watched them walk. To help her do this she had a lab full of gadgets and movement sensors, to detect things like speed, symmetry, variability, rhythm and postural control of gait. In fact, the one of the systems used to capture gait metrics in Ríona’s study (the Vicon Motion Capture analysis system) was also used by Benedict Cumberbatch while playing Smaug in The Hobbit film, adding a touch of showbiz to the whole affair! The outcome of the walking trials offer some good news, with the dementia vs. non-dementia groups appearing to walk differently. Dementia patients demonstrate more variable step lengths, generally shorter strides and less symmetry between the two sides of their body when walking. With Lewy body disease there was also significantly more asymmetry, probably reflecting the way the brain degenerates unevenly during the course of the disease. Ríona explained that while the results look promising, a larger study with more participants is needed before the research can be used to help diagnose patients. The need for a large study number was highlighted when the intrigued audience raised questions about how leg and foot injuries may influence walking results. Riona assured us that with enough participants any influence of ‘unique walking styles’ or unrelated walking-problems, should not significantly affect the study outcome. Ríona left the SciBar audience feeling pleasantly optimistic as she spoke of her hope of seeing a day when a dementia diagnosis is not so feared, because of the knowledge we’ve gained, improvements in the diagnostic process and effective treatment options. That day may arrive sooner than we think if novel research such as this continues to bring useful new insights to the conditions facing today’s society. If you are interested in getting involved in Ríona’s labs latest research, please go to https://research.ncl.ac.uk/bam/ to find out more. Have you heard about the 40 million-year-old bacteria that survived inside the abdomen of a bee, preserved in a chunk of amber? Amazingly, when removed from their amber tomb and given nutrients, the bacteria were still able to grow! Our speaker this month, postgraduate researcher, Clare Willis, from Newcastle University’s Centre for Bacterial Cell Biology, explained how this is possible. When conditions become extreme, some bacteria create an ‘escape capsule’ that allows them to survive in an inactive state, until the environment becomes more favourable. This ‘escape capsule’ is known as a spore and contains all the bacteria’s genetic material packaged up into a hardy capsule, that protects it from damage. Clare explained to the captivated audience that this spore state can be problematic for humans. Many bacteria, known for their antibiotic resistance in hospitals, such as Clostridium difficile, can make spores that are difficult to destroy. Anthrax infections and botulism are also caused by spore-forming bacteria. These spores can lie dormant and undetected, before flaring up rapidly and causing serious infections. Infographic showing how a spore forms within a bacterial cell once the bacterial DNA has been duplicated. Clare’s research for her PhD looked at how spores are created, which could offer valuable insights into how spore-forming bacteria can be controlled. Under normal replication conditions bacterial cells split in half to make two copies, each containing one complete set of DNA. When the environment becomes uninhabitable and a bacterial cell ‘decides’ to make a spore, the DNA is copied as usual, but the cell separates into a smaller cell (‘prespore’) and a larger one (the ‘mother cell’). This means that one copy of the DNA must move across the dividing cell into the prespore. Clare’s work looked at how this happens ─ with the aid of fluorescent tags stuck onto the DNA. These tags allowed her to study the movement of the DNA with a microscope, by tracking the fluorescent colours. Once she tagged the DNA she found something surprising ─ both DNA copies moved towards the prespore, not just one. This led her to think that the two DNA copies must be attached together in some way. Clare carefully considered and assessed four different ways the DNA could be connected. Her favourite theory, most supported by the evidence, is that the two copies of DNA are held together by proteins. Clare hopes to do further work to find out more about these proteins and thus better understand how spores form. Fluorescence microscopy pictures by Clare Willis and a supporting diagram to show how both copies of DNA within a bacterial cell move together toward the ‘prespore’ when packaging DNA into a spore. A particular region on the DNA is labelled in red and the outside of the cell is labelled in green. Each picture is taken 15 minutes apart. What happens to the mother cell after the spore is formed? It bursts and dies! How long does it take to make a spore? Longer than normal cell division, as the spore needs to be coated in proteins before it can emerge from the mother cell, usually a few hours. Do all bacteria in a community make the same ‘decision’ about when to make a spore? A population of spore-forming bacteria will differ in the timing of spore production, depending on how each cell senses and responds to environmental changes. And how long does it take a spore to ‘germinate’ and start growing again? Depending on the species, bacteria can emerge from the spore within hours of exposure to a suitable environment and nutrients. Clare’s excellent talk gave us all a great introduction to the wonderful, microscopic world of bacteria and one of their most extreme survival mechanisms. 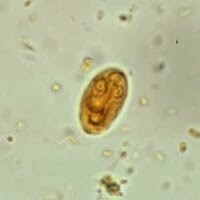 For this month’s SciBar we were taken on a microbiology rollercoaster; from the highs of an ‘outstanding’ care quality commission assessment, to the lows of the Bristol stool chart. Angela Geering ─ a Training officer and Advanced Biomedical Scientist ─ talked us through her experiences as a Blood culture section lead at the Freeman hospital. Rosy-cheeked from the warm weather, the crowd at The Old George soon learned the impact of the sunny season on hospital infection rates. The lure of an open-toed sandal leads people to finally confront those discoloured toenails and cases of athlete’s foot skyrocket. As BBQs are fired-up, hungry people take their chances with undercooked chicken, meaning Salmonella diagnoses become commonplace. However, as the worrying list of bacteria grew, Angela reminded us how these invaders are rapidly diagnosed and treated within our beloved NHS. Integrated laboratory medicine ─ testing and treating medical samples in hospital laboratories ─ provides 70% of diagnoses. Everything can be screened for infection; from ‘standard’ samples like blood, stool and urine, up to transplant organs, heart valves and solid joints. Even swabbing the inside of a detached finger is not beyond Angela’s expertise. Such examples, and many more, all contribute to the 1 million samples that are processed through the Newcastle facility every year. Impressively, Angela and her team can identify a positive blood culture within 30 minutes. Some bacterial classification involves spreading blood cultures on agar ─ a jelly-like substance enriched with different nutrients. When stored at an appropriate temperature, nutrient-rich agar promotes rapid bacterial growth. Special compounds can be added to the agar to help identification. For example, E. coli (Escherichia coli) ─ a major culprit for urinary tract infections (UTIs) ─ will appear pink on the appropriate agar. Once grown, the size and shape of a bacterium may also reveal its identity, and microscopy is used to locate clusters, pairs, rods or chains. Angela notes that many routine lab tests are still manual – requiring an actual scientist to run the test and/or analyse the results. However, with improving technology, an increasing number of tests are becoming automated to reduce labour, time and cost of analysis. 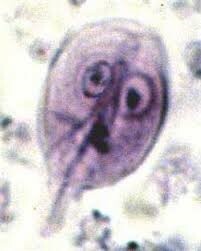 Caption: The friendly ‘face’ of Giardia lamblia – a common faecal parasite. Transferred through infected water or food, it colonizes and reproduces in the small intestine causing diarrhoea and abdominal pain. It’s unsurprising that work as a biomedical scientist can sometimes get a little smelly, but this doesn’t deter the team from “putting patients at the heart of everything we do”. This became clear as Angela described the network in place to ensure efficient transfer of medically relevant information. Following sample analysis, the team work closely with consultant microbiologists and medical staff to advise on treatment options. From receiving samples, right through to treatment, experts in every step of the process contribute to a positive patient outcome. Understandably, speed of diagnosis is important, especially if there is an unknown outbreak on a ward. One bacteria high on the NHS ‘watch-list’ is Clostridium difficile, also known as C. difficile or C. diff. C. diff was named for being notoriously ‘difficult’ to grow and study in the lab. Infections usually occur following antibiotic-use that degrade the existing ‘good’ bacteria in the gut. C.diff symptoms include diarrhoea and stomach cramps, however, if untreated, the infection can become much more serious. An outbreak of C. difficile is so tricky to contain that hospitals operate strict patient-care procedures, equipment cleaning methods, and there is even a financial incentive to prevent its spread. Only 76 cases of C. difficile are allowed per calendar year, with each additional case costing a hospital £10,000. With hospital-outbreak horror stories vivid in the mind, this was a main source for questions from our crowd. We learnt that MRSA (Methicillin-resistant Staphylococcus aureus) ─ a familiar villain of newspaper headlines ─ is now considered ‘old-school’ in microbiology circles, with an NHS target of zero cases for 2018/19. There is however, a new bacterium to keep our biomedical scientists busy: Carbapenemase-producing Enterobacteriaceae, or CPE for short. CPE cases are increasingly detected in UK labs and worryingly, are showing signs of multi-drug resistance. Currently, antibiotic resistance is as high on the international public health register as terrorism. While alarming, we can take some comfort in the fact that the risks of this threat are being taken seriously. Angela also helped to stem our fears with the news that; while resistance is a problem, her team are yet to face a patient they couldn’t treat. Alongside their dedicated work in the lab, members of the team additionally scan the medical literature to predict what beastly bacteria may be next to infect the North East. The team are up to date on the threats and well-prepared for how to deal with them. So, try not to worry, it seems we’re in good hands!